Originally written in French, of course, we picked up this book in a hurry one day because of the fanciful photo of rose petals littering a warehouse floor. Like many coffee table books, the pictures in this book are a work of art. The full page picture of a lavender field deserves to be framed. Scent rises from the pages with enthusiasm and reality (we thought perhaps the book had been lightly perfumed). More than just a pretty face though, The Book of Perfume is brimming with aromatic stories of perfumery throughout history. It emphasizes that all perfume started with scented plants. Scented plants that we can grow in our gardens and revel in daily. It is hard to believe that one of the original primary functions of perfume at its inception in the late 1500's was to mask the odor of tanned skins used for the large glove making industry in, where else, Provence, France. A most compelling chapter of perfume history takes place in this country, in 1946. At that time 85 percent of all fragrances sold in America were French. Even more astounding was that the major purchasers were men. It was considered a gift men gave to women and not a purchase women made for themselves. It was the insight of Estee Lauder that gave women the right to purchase. She didn't create a perfume at first, because she knew that would defeat her purpose; she created perfumed bath oil. It was called Youth Dew and it was a sensation. She waited another 15 years to introduce an actual perfume. 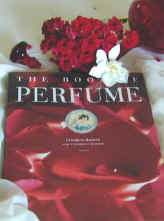 From the flower to the bottle this book is rich in information about fragrances. It has very unique information like a section on classifying name brand perfumes by the seven fragrance families, citrus, floral, fougere, (a combination of lavender and moss), chypre, (a combination of bergamot and moss), woody, amber, and leather. And, an extensive chapter on the history of perfume bottles and perfume ephemera. Laced with photos of glamorous stars, serious scientists at work and fields of luxurious flowering plants, this book grips the interest with the turn of each page. Estee Lauder once remarked "Perfume is like love, you can never get enough of it." Reading this book is a little like that. Additional books on fragrant plants you may like!